Non-refillable gas cylinders by Scientific and Technical Gases (STG) are now available from ProDetec . STG supplies custom made high precision gravimetric calibration gas mixtures and high purity gases in a range of modern, compact and lightweight disposable cylinders. The non-refillable gas cylinders are ADR suitable, manufactured to international standards, and can be transported by road, sea and air worldwide. 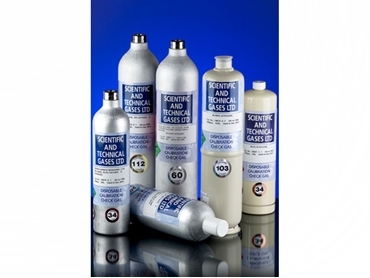 STG supplies all corrosive toxic components in non-refillable cylinders including NO, NO2, NH3, H2S, SO2, HCL, HCN and Cl2 as well as the full range of LEL mixtures and common gases. Scientific and Technical Gases is a leading manufacturer of high pressure gas mixtures made gravimetrically to ISO 6142. All mixtures have international traceability via National Physical Laboratory standards used in the manufacturing process.